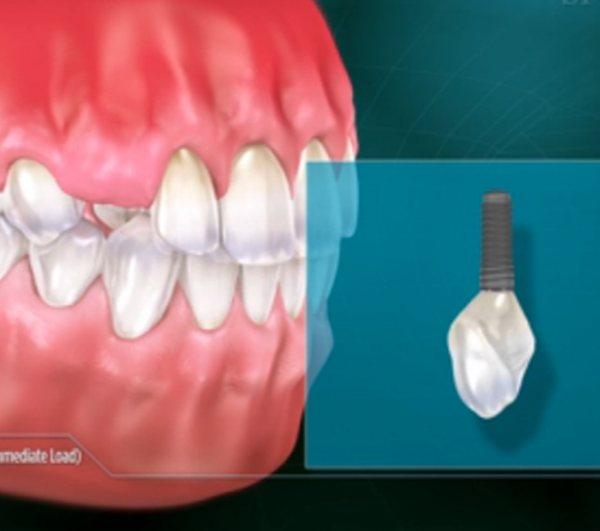 Implants are titanium root replacements for teeth. They are made to match your existing teeth or even enhance your existing smile. An implant can be used to replace a single missing tooth, multiple teeth, or as the support for a removable denture. Implants are wonderful, long-lasting, strong restorations that have a success rate of over 90%. They usually last longer than the teeth and require little maintenance but may require adjustments or repairs over time due to normal wear. The process of getting an implant requires several well-planned appointments with your dentist and the appropriate specialist, usually a periodontist or an oral surgeon. During a minor surgical procedure, the implant is placed utilizing a custom guide that we provide. The implant crown or bridge is place 4-6 months later. In the interim you are often given something to wear to temporarily replace the missing tooth or teeth. If you know that you may lose a tooth due to gum disease, decay or a fractured root, an implant is an excellent choice and can sometimes be placed the same day the tooth is removed. An appropriate temporary restoration is inserted the same day so there will be no visual changes in your smile during healing, and in fact, sometimes the smile is improved while wearing the temporary. If there have been teeth missing for a long time some additional procedures may be required to improve the bone quality in the area prior to implant placement. So, if you are missing bone an implant can still be a good restoration for you. This is especially true for patients that have poor-fitting old dentures. There is unlimited potential for implant restorations and they are one of the most exciting options we have in dentistry today. Once placed, implants require normal brushing and flossing. You will be given care instructions and tools to achieve good health around your implant. Remember that regular dental visits will aid in the life of your new implant restoration.